Ah, San Diego. The birthplace of California! There’s a lot to love about this beautiful city (even if the traffic isn’t one of them) and it’s a great place to buy a home and raise a family. But what if you have bad credit? Anyone whose score is below 650 knows the struggle of getting rejected for a home loan over and over again. Get Help Pre Qualifying for a San Diego Low Credit Home Loan – Click Here! But while conventional loans often come with unreasonable requirements, a bad credit mortgage San Diego are a great way for anyone, regardless of income, to find a beautiful house of their own. The first step to finding a bad credit mortgage is understanding what two things mortgage brokers look for when they decide to approve or reject an application. The first of these, of course, is your hard pull credit score. This score is a measure of how good you are at handling your debts. It’s mostly calculated by looking at your credit utilization and your history of payments made on things like debts and credit card bills. 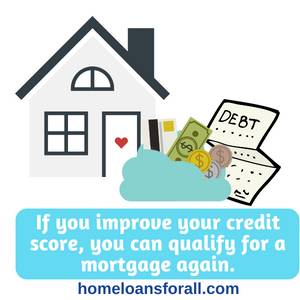 The higher your score, the reasoning goes, the more likely it is that you will pay back your mortgage and any company that lends you money will get their money back. The second most important factor for any San Diego mortgage broker is kind of similar to your credit score, and many people get them confused. It’s your debt-to-income ratio, a separate measurement that compares your outstanding debts (student loans, auto loans, etc.) to your total gross income. Most lenders want your D-I ratio to be 40 percent or less. So what do you do if your credit is low and your debt is high? You still deserve to find a home of your own, and there are lots of government programs that can help you find a bad credit mortgage in San Diego. Plus, there are alternatives like renting to own or finding a co-signer. 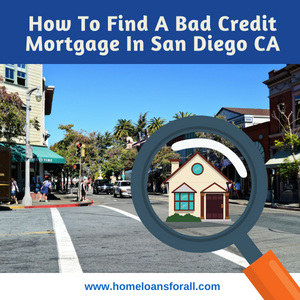 We’ll discuss all of these in this article, which will hopefully serve as a comprehensive guide to bad credit home loans in San Diego, California. In addition to the bad credit home loan programs offered by the state of California, San Diego has its own housing commission, the SDHC, which offers deferred loans, homeownership grants, and mortgage credit certificates to low income families in the city of San Diego who have never bought a home before. These programs will help you pay your closing costs, which is not the same as a bad credit mortgage in San Diego, but can still be very helpful because bad credit home loans almost always have higher closing costs to make up for the risk of accepting a bad credit buyer. If your credit score is at or above 580, a Federal Housing Administration loan will only charge you for a 3.5 percent closing cost. If it’s lower, you may be able to make up for the difference with alternative forms of credit (usually proof of regular utility or phone bill payments) or you may have to pay closing costs as high as 10 percent. Not bad when you consider that most conventional home loans start at a 20 percent down payment. 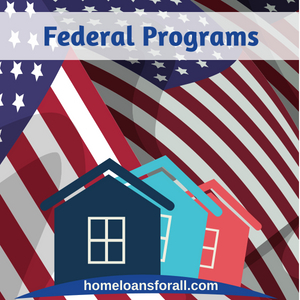 FHA loans are not paid out by the federal government (a common misconception) – just insured by them. But since these loans provide the best of both worlds with low credit requirements AND low down payments, we highly recommend checking them out! They’ll save you thousands of dollars and help you find a house with bad credit…so long as you are an active service member or veteran. 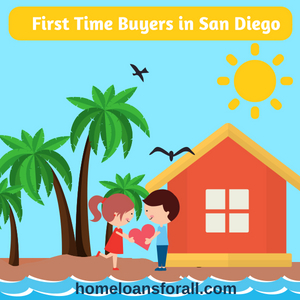 First time buyers in San Diego who have bad credit should start their home ownership journey by considering an FHA home loan. These bad credit mortgages in San Diego have no minimum credit requirement, low down payments, and reasonable fixed interest rates. So if you haven’t had time to build up credit or save up much for a down payment, the best choice is pretty obvious! If your credit score is too low for even a rental contract, there’s still a way for you to find a good home to live in. If you can find someone to co-sign a bad credit mortgage with you, the lender will treat your credit like it’s the same as theirs. This means that you will be more likely to get accepted and that you may have more favorable terms on the loan and the interest. However, by cosigning your loan your San Diego cosigner is tying their credit score to your property. You’d better make sure that they understand the responsibilities involved in co-signing and that you do too before you ask someone to do this for you. In most cases, a co-signer will be a close friend or older family member. If you’re unable to find a mortgage broker in San Diego who is willing to work with your low income or credit score, another option is to rent a property now that you will buy outright in the future. 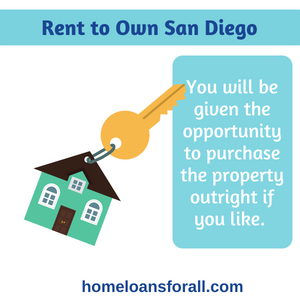 This means finding a rent-to-own property in San Diego and signing a contract with a potential options fee. The fee’s annoying, but just think of it as a down payment on the house that you may buy outright later. Throughout the course of your lease, a portion of your monthly rent payment will be applied towards the principal of the home. Once the lease has ended, you will be given the opportunity to purchase the property outright if you like. This gives you time to repair your credit, which is good, because you will need to find a bad credit mortgage lender in San Diego at this point in order to finance the remaining balance of the home. When you fail to make one of your mortgage payments, the house may move into foreclosure or you could be forced to file for bankruptcy. Both of these are major life events that can have a serious impact on your credit score. They can also prevent you from qualifying for future financing on a new home. If you improve your credit score, you can qualify for a mortgage again. But there are certain waiting periods on home loans in San Diego. Conventional mortgages will require you to postpone the purchase of a new home for seven years or more. Fortunately, many of the federal programs have much more lenient waiting periods. FHA loans in San Diego require a three-year waiting period while VA loans require only a two-year waiting period. Looking for assistance in finding a bad credit mortgage in San Diego? Good choice! We know a lot, but one generalized article can’t help you the way that a qualified counseling agency or the California Housing and Finance Agency (CalHFA) can. We recommend you start there first! They can answer specific questions, give advice, and guide you on your home buying journey in San Diego. If your credit score is just too bad to apply for government programs, mortgage assistance, or even the rent-to-own option, it’s time to start taking credit repair seriously. Of course, you should be working to get your score up even if you’ve found a home loan, or even if you already have great credit! Remember: there’s nothing a credit repair agency can do for you that you can’t do on your own. There’s two things that will have a HUGE positive impact on your credit score in San Diego if you start doing them right away. The first: regularly pay your phone, credit card, and utility bills on time and in full every month. 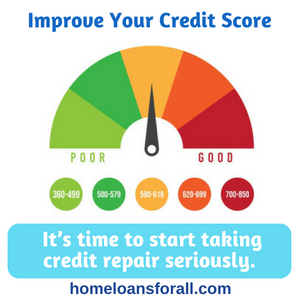 Your FICO score is mostly derived from your history of making these sorts of payments, so this is the biggest and best way to improve your credit. The second way: start reducing your overall debt. Pay down your high interest credit cards and pay off student loans. Free up your income. This improves your debt-to-income ratio AND your credit score. Now that you know all about the best bad credit mortgages in San Diego, we hope you’ll consider taking out an FHA or VA loan of your own some time in the near future. We at Home Loans For All believe in the message of our website’s name: everyone deserves to live in a place of their own and should be able to find a home loan that works for them. No matter how difficult it seems, never give up!